The Sports Series (latest teaser image shown) will use a de-tuned version of the 3.8-liter V8 gasoline engine found in the pricier McLaren 650S and P1. Output has not yet been confirmed, but the latest reports say that the Sports Series will produce "well over" 500 horsepower. 0-60mph will likely take less than 4 seconds, with a top speed of around 180mph. "Like our other models, this one will have a higher power-to-weight ratio and better performance figures than any rival," says Flewitt. 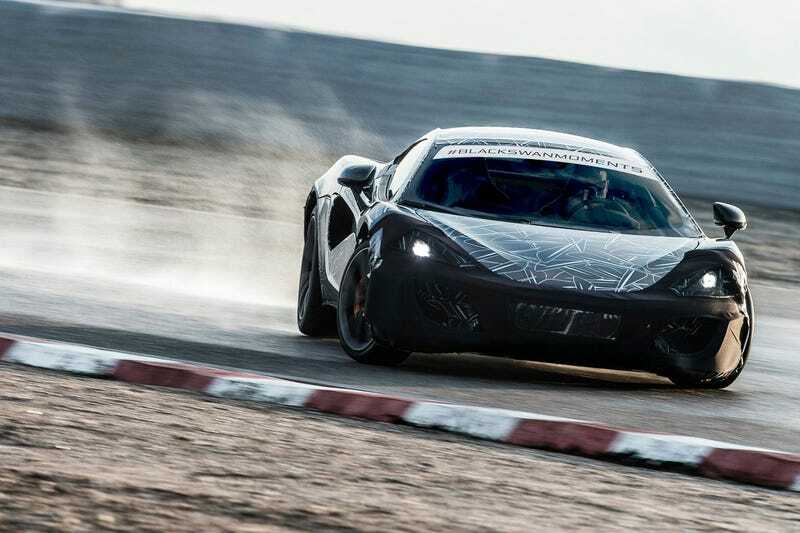 Dimensions and weight will reportedly be shared with the 650S, but no body panels will be found on both cars. As we can tell from the numerous teaser images, McLaren's current design language will be carried over, with cues like butterfly doors and LED lighting elements. The Sports Series will be aimed at the Porsche 911, BMW i8, and Mercedes-AMG GT, with prices starting at around £130,000 (roughly $202,000) in the UK. Stay tuned for more details closer to the Sports Series' New York debut early in 2015.